Can you whistle, Johanna? There are plenty of old men who would do as a grandfather at the retirement home, Ulf suggests, when Berra wonders why he doesn’t have one. They go there together to find one—ideally one who eats pig’s trotters, invites you to tea and who can teach you to whistle. This story touches the heart. It manages to be charming, warm, funny, poignant and sad all at once and it’s told in such a way that a grandparent can reminisce and a young person can understand about friendship and loss not just through their own eyes but through the perspective of a much older person. ‘Grandfathers are special people, aren’t they? Perhaps you have one, or if you’re very lucky, two. But what if you have no grandfather? In this month’s book, we meet Ulf, who has a grandfather, and Berra, who does not. Ulf’s grandfather takes him out to tea, and to fish in the lake, and he always gives Ulf money. When Berra hears what grandfathers do, he wants a grandfather too. But where can he find a grandfather? Ulf knows exactly where. When the two boys visit the old people’s home, Berra meets Ned, who is happy to have a new ‘grandson’. Ned makes a kite for the boys, and […] shows Berra how to whistle. To find out what the boys do for Grandpa Ned’s birthday, and what happens when Berra finally learns to whistle, you’ll need to read ‘Can You Whistle Johanna?’ all the way through. Can you Whistle, Johanna? is a book that is sad, yet happy at the same time. It is about a boy who tells his friend about his grandad. This friend named Berra says, ‘I don’t have a granddad’. So they go out to a rest home to find a granddad. They find one man who is all alone. Johanna walks in and says, ‘Can you be my grandad?’. Through the book they go on loads of adventures, but in the end they end like all adventures end, tragically. Can you Whistle, Johanna? is a great book and a great read for all ages. Read it A.S.A.P. There are plenty of old men that will do as a grandfather at the retirement home, Ulf suggests when Berra wonders why he doesn’t have one. They go there together to find one – ideally one who eats pig’s trotters, invites you to tea and who can teach you to whistle. It is a warm funny story about a friendship between an old man and two boys. It is also a gentle account of companionship and loss. Ulf Stark is from Sweden and writes children’s books, which can be happy and sad in the same sentence. His books have been made into films, plays and television series’. In all, he has written over 30 popular books for children and young adults. He remains one of the most well-known authors in contemporary Swedish children’s literature and his books have been translated into more than 20 languages. Ulf Stark says that Can you Whistle, Johanna? is possibly the best book he has ever written. It is a picture book that five to 12 year-olds will enjoy and can learn from. Gecko Press makes it possible for New Zealand children to read books like this by buying the rights to translate European books into English. Children in New Zealand and other English speaking countries have missed out on some fantastic European books by award winning authors simply because they have not been translated into English. Julia Marshall, Gecko Press publisher, decided to change this. Can you Whistle, Johanna? is the third book that Gecko Press has translated. When Ulf boasts to Berra that his grandfather often gives him cake and money, Berra decides that it’s time he had a grandfather too. Ulf offers to show Berra where he can find a grandfather and takes him to a local old people’s home. There they meet Ned, and Berra introduces himself as his grandson. ‘Well, my, but how you’ve grown’, says Ned who takes the boys to the cafeteria for buns, and introduces Berra to the old people as his grandson. Gradually a relationship develops between Berra and Grandpa Ned. One day, he gets the boys to take him to a park, where he makes them a kite, using a beautiful silk scarf, which had belonged to his late wife. Ned uses his tie for a kite-tail and whistles a tune called, Can you Whistle, Johanna? ‘My wife was called Johanna’, says Ned. Berra tries whistling, but fails. Ned tells him to practice. Because there is no wind, they agree to fly the kite another day. For Ned’s birthday, Ulf and Berra buy gifts and give him a shave. Then, because he wants to do something fun and exciting, they help him climb up into a cherry tree and eat the cherries. (The tree belongs to Ulf’s long-suffering neighbour, the angry Mr Gustavsson who appears in many of Ulf Stark’s novels.) ‘I did it,’ Ned chuckles, ‘Did you see me?’. Afterwards Berra gives Ned a new silk tie, and the boys push him back to the home in a wheelchair. The colour illustrations are by Anna Hoglund, a Swedish illustrator living in New York. The book was first published in Swedish in 1992, by Bonnier Carlson Bokforlaget of Stockholm. It has also been adapted for the National Theatre in Stockholm. The film version is screened each Christmas on Swedish television. An English language edition, translated by Julia Marshall, was produced by Gecko Press, Wellington, New Zealand in 2005. A story about two boys, Ulf and Berra. Ulf has a grandfather, but Berra doesn’t. The two boys visit an old folks home to find a grandfather for Berra and they ‘adopt’ him. The boys’ visit Ned and he teaches them how to make a kite and to listen to the birds. The boys take Ned on an adventure for his birthday. Ned teaches Berra to whistle and Berra practices all the time. He waits until he can whistle Ned’s favourite tune, Can you Whistle, Johanna? before he visits Ned again. But when Berra and Ulf go back to the old folks home, Ned isn’t there any more. It was a funny story, but we thought the ending was a little sad. Our Mum like it too. A boy named Berra is in need of a grandfather. And his friend knows just the place – the old people’s home. This is an easy story to read and the illustrations were good because if you couldn’t read, you can tell exactly what’s happening. I like it because it had an interesting beginning and lots of adjectives. I would recommend the story for others to read because it’s an easy book for seven- to eight-year-olds. This is a book about friendship and loss. It is the story of Ulf and his friend Berra who are trying to find Berra a grandfather – ideally one who eats pig’s trotters! They find Berra a grandfather at a retirement home. I’ve read another book by Ulf Stark and he is a great writer. I really enjoyed it. It is written in a way that it could be understood by children from five to 12 years old. Two small boys make friends with an old man in a retirement home and all bring something special to the experience. A poignant story that does not shirk the fact that old people inevitably die, it is also very funny and is said to be Ulf Stark’s favourite title. Berra doesn’t have a grandad, so his friend Ulf suggests they go to the local rest home and find him one. They meet Ned, and Berra adopts him as a grandad. 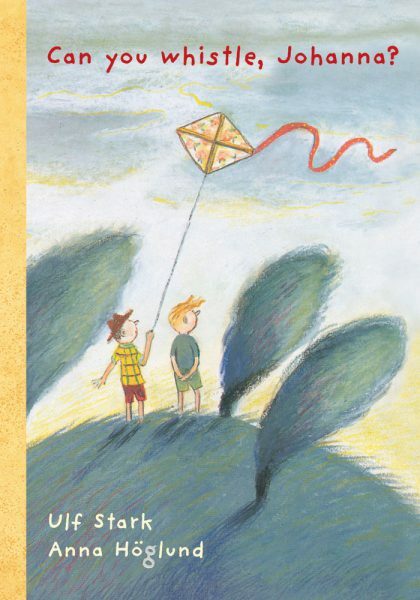 Ned teaches Berra and Ulf to fly kites, eat pig’s trotters and to whistle, but they are also taught a much harder lesson about life and loss. This tale is from Swedish author Ulf Stark, who has twice been nominated for the Hans Christian Andersen award. The simple, colourful illustrations complement this humorous and sensitive book. This lovely book would suit a wide range of ages. With its beautiful pictures it could be read aloud to smaller children, while older children would be able to enjoy it by themselves. Ulf and Berra are very good friends. Ulf shares with his friend all the fun he experiences when he goes to visit his grandfather where they eat pig’s trotters, go out for tea together and the grandfather teaches Ulf to whistle. Berra is a bit jealous of Ulf’s grandfather and can’t understand why he doesn’t have one, but rather than waste time pondering this problem, Ulf and Berra visit the local retirement home to find one. His new grandfather wants to teach Berra how to whistle, but when the boy finally masters the art, his ‘borrowed’ grandpa dies. At the funeral Berra whistles a farewell salute, Can you Whistle, Johanna? This is a warm and funny story about the friendship between two boys and an elderly man and shows how easy it is for a boy to find a mentor for life. The author is from Sweden and has written more than 30 books, some of which have been made into films and plays. Can You Whistle, Johanna? was the winner of the German Youth Literature Prize. Julia Marshall has translated this story for the New Zealand market. I enjoyed this story and it made me smile. Ulf Stark states that he includes the grief so that the joy is clear. Can you Whistle, Johanna? is a lovely story, which could be easily read in a single sitting and addresses the issue of grief in a sensitive manner. Why doesn’t Berra have a grandfather? How can he get one? This special story enhanced by New Yorker Anna Hoglun’s Chagall-like pictures is a Swedish classic already translated into many other languages. It tells how Ulf suggests his friend Berra might find a grandfather by visiting the local retirement home and attaching himself to one of the residents there, preferably one ‘who invites you to tea’ and, among other things, ‘can teach you to whistle’. This he does with often delightful consequences. 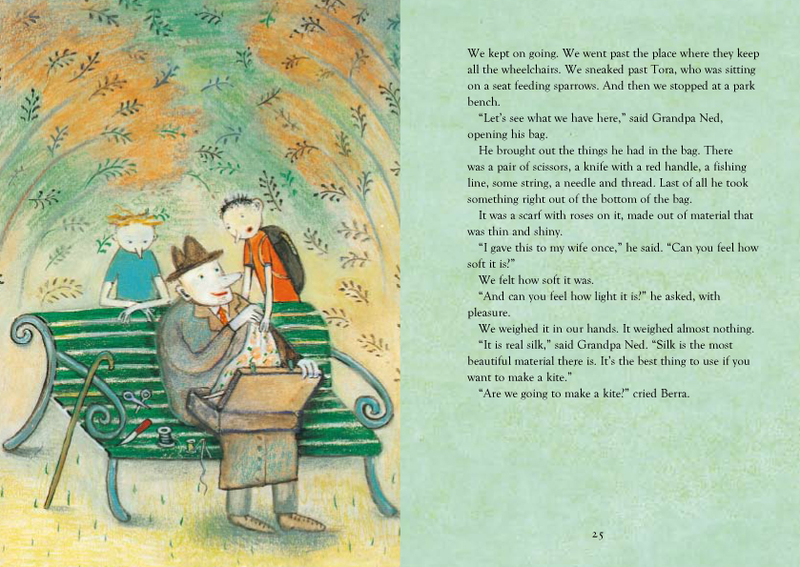 A quirky and sensitive book about a friendship between two little boys and one old man. Ulf’s friend Berra is lacking a grandfather – a situation the pair immediately set out to rectify. Their efforts to train the elderly man they select from a nearby old people’s home meet with tolerable success. Stark’s understated humour combines with the deceptive simplicity of his prose to create a charming story. The old man’s death is dealt with in a very matter of fact way, offset against the gentle humour throughout. Highly recommened for eight to 11 year olds. Can you Whistle, Johanna? is a treasure. What could be a sentimental story of a boy who doesn’t have a grandfather so goes to find one, is told with humour and an honest look at relationships. Berra wants a grandfather because they give you money and do special things with you. His friend Ulf suggests the old-people’s home as a good source of spare grandfathers and so they simply walk in and claim one. The chosen old man plays along willingly, pleased to suddenly have a grandson, teaches Berra to whistle – hence the title of the book – and shows him off to the other residents. The interaction is mutually gratifying as the boys make regular visits and take him on a birthday outing that includes climbing a cherry tree as he did when he was a boy. When the story reaches its inevitable sad ending we know that everyone has gained something from the charade, some happy times for an old man without a family, and experience and memories for the boys. The illustrations capture the simplicity of the story perfectly with stark backgrounds and cartoon-like characters. The world of childhood seen through the eyes of the young boys is emotional and exuberant. 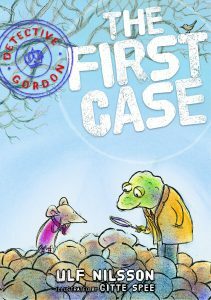 Gecko Press is a new Wellington-based publisher that translates award-winning European children’s books into English. Can you Whistle, Johanna? is aimed at under-12s and is a classic illustrated novel. A boy adopts a grandfather living in a retirement home and takes him on adventures that relive his youth. A sweetly poignant tale that brings both laughter and tears. Highly recommended. There are so many children’s books on the shelves that the purchaser is spoiled for choice. You are never quite sure whether it will appeal to the child in mind! This particular one does stand out though, and speaks straight form the mouth of a child while at the same time telling a story with warmth, compassion and wisdom. Ulf Stark is a name to watch out for – his books are just starting to be translated from Swedish into English and if you are ever looking for a book for a child, I don’t think his will fail you. This charming story will appeal to a range of children – particularly boys – from five to 12 years. Berra, the first boy in the story, wonders aloud to his friend Ulf, just why he doesn’t have a grandfather like Berra does. No problem, says Berra, we will find you one, and off they go to the local retirement home to find a grandfather. Grandfathers, according to Berra, eat pigs trotter’s in jelly, take you fishing, and give you five dollars on their birthday! Ulf’s new chosen grandfather (once he’s got over the surprise) fulfils all the boys’ dreams, while teaching them lovely lessons about life, particularly how to whistle, hear birdsong, and how not to be old. Not just a ‘one-line per page’ book, it is easy to read, funny yet gentle, it tells a story of companionship and loss. Charmingly illustrated – highly recommended! Ulf Stark’s story, enhanced by New Yorker Anna Hoglund’s quirky pictures, is already a classic in many countries. Ulf suggests his friend Berra find a grandfather by calling at the local retirement home and attaching himself to an old man – which he does, with often delightful consequences. A very upbeat tale that does not shirk from the inevitable, coffin-side ending. Can You Whistle, Johanna? is a quirky, sensitive story of two boys and their friendship with an old man. 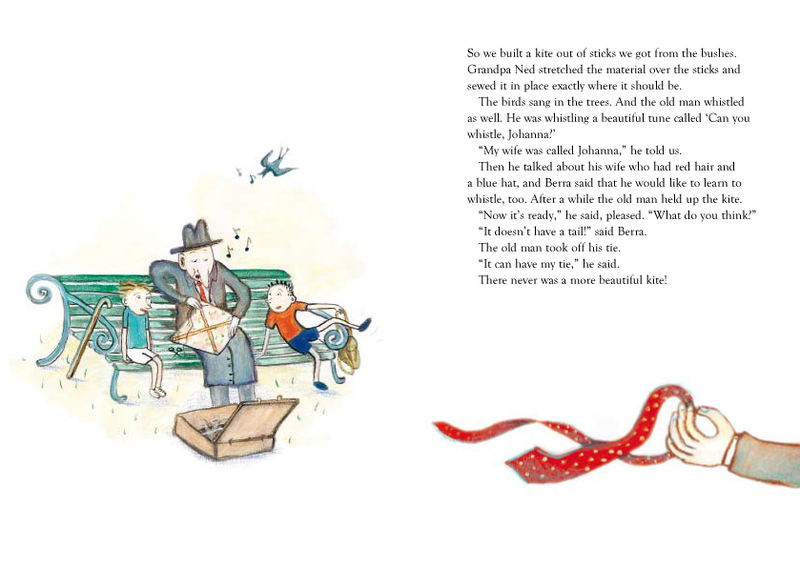 Berra doesn’t have a grandfather so he and Ulf visit the retirement home and ‘adopt’ Ned, who takes them to tea and teaches them to whistle and fly a kite. But, one day Grandpa Ned is gone. Vibrantly illustrated by Anna Hoglund, this would be a wonderful read-aloud for years three, four and five classes. This is an extraordinarily tender, beautiful story of friendship and loss. Stark combines searing poignancy with joyous humour and the most lyrical phrases to produce a quirky, endearing story that deeply touches the heart. 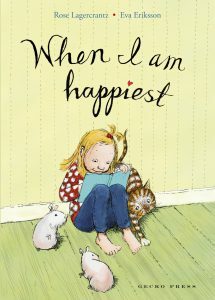 It has been described as a wonderful read-aloud story for years three, four and five, and I couldn’t agree more.